Two aides to Republican presidential nominee John McCain have stood down over ties to a lobbying firm that has represented Burma's military leaders. Douglas Goodyear, who had been chosen to run the 2008 Republican convention, said he was resigning "so as not to become a distraction in this campaign". Burma's government has been criticised over its handling of relief efforts following a cyclone nine days ago. 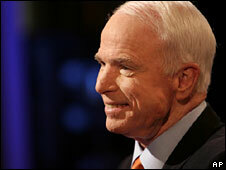 BBC correspondents say the affair is embarrassing to Senator McCain. The Arizona senator's campaign website carries a strong condemnation of the military government in Burma. Both Mr Goodyear and the second aide to resign this weekend, Doug Davenport, worked for the lobbying firm DCI, the former as its chief executive. Newsweek magazine revealed on Saturday that DCI was paid more than $300,000 (£150,000) by Burma's military leadership for lobbying work to improve its image in the US. Offering his resignation as convention coordinator shortly afterwards, Mr Goodyear said he was standing down "so as not to become a distraction in this campaign". He added: "I continue to strongly support John McCain for president." A spokesman for the McCain campaign said it respected Mr Goodyear's decision. Mr Davenport, a regional campaign manager for Mr McCain, reportedly was directly in charge of the DCI lobbying efforts on behalf of Burma's authorities in 2002. The BBC's Jamie Coomarasamy in Washington says the prominent role of lobbyists in Mr McCain's campaign was already controversial, given Mr McCain's frequent pledges to fight against the influence of special interests in Washington. That two of those lobbyists were linked to a special interest currently facing worldwide condemnation should give cause for reflection within Mr McCain's inner circle, our correspondent adds. There has been international outcry over the Burmese authorities' response to Cyclone Nargis. The US State Department has previously criticised Burma over its human rights record.